(ZIZ News) — Thirty officers graduated from the Recruit Training Class Number 40 during a ceremony at the Police Training Complex on Tuesday evening. During his feature address, Police Commissioner Ian Queeley thanked the officers for their service, sacrifice and decision to commit to law enforcement. “Course 40, first and foremost I must thank each and every one of you for the service and sacrifice as you answer the call to undertake this most strenuous but noble path of law enforcement. The six months of training that you have undergone, was intense, grilling, arduous and exhausting but of a very high calibre. Your training was designed to prepare you for the road ahead. Your course leaders and trainers have given you the tools to become capable, incomparable and excellent members of the law enforcement family”, the Commissioner expressed. Prime Minister and Minister of National Security, Dr. The Hon. Timothy Harris congratulated the graduating class. “We congratulate you officers, and your efforts and your dedication to National service. 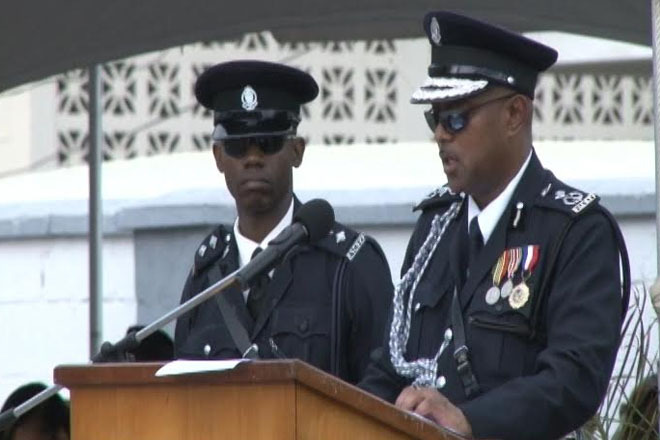 You have studied a number of modules, so as to attain the essential skills required of you, in order to be able to discharge your duty as police officers in the Federation of St. Kitts and Nevis”, the Prime Minister stated. Theoretical topics covered included Evidence and Procedure, General Duties and Criminal Law while Practical sessions such as Physical Training, Self Defense, Weapons Training and Foot and Arm Drills were reviewed during the 6 month training period. A total of 21 male and 9 female Constables have now joined the rank and file of The Royal St. Christopher and Nevis Police Force.